One of the more advanced tricks I like to exploit are analytic Top-N queries. Although I am using them for quite a while, I recently discovered a “limitation” that I was not aware of. Actually—to be honest—it’s not a limitation; it is a missing optimization in a rarely used feature that can easily worked around. I must admit that I ask for quite a lot in that case. The article starts with a general introduction into Top-N queries, applies that technique to analytic queries and explains the case where I miss an optimization. But is is really worth all that efforts? The article concludes with my answer to that question. Please find the CREATE and INSERT statements at the end of the article. A full table scan is performed—more on that in a few seconds—to retrieve all the rows that match the where clause; about 370 according to the optimizers estimate. The next sorts the entire result set. Finally the limit is applied—the COUNT STOPKEY step—and the number of rows is reduced to three. You can see that the full table scan was replaced by an index lookup and the corresponding table access. The other steps remain unchanged. Well, that is efficient. The sort operation has vanished at all because the index definition supports the ORDER BY clause. But even more powerful, the STOPKEY takes effect down to the index range scan. You can see the reduced number of table accesses in the plan. Although not visible in the execution plan, the index range scan is also aborted after fetching the first three records. Well, that optimization is in the Oracle database for quite a while—at least since 8i I guess. After that preparation, I can demonstrate what 10R2 has to offer on top of that. Analytic functions can perform calculations on the basis of multiple rows. However, not to be confused with aggregate functions, analytical functions work without GROUP BY. A very typical use for analytical functions is a running balance; that is, the sum of all the rows preceding the current row. The function used in the example (dense_rank) returns the rank of the current row according to the supplied OVER(ORDER BY) clause—that is, in turn, not to be confused with a regular ORDER BY. orafaq.com has a nice intro to Oracle analytic functions. The fist step is to fetch the smallest group_key. Because of the min/max optimization in combination with a well supporting index, the database doesn’t need to sort the data—it just picks the first record from the index which must be the smallest anyway. The second step is to perform a regular index lookup for the start_key and the group_key that was just retrieved from the sub-query. What was the COUNT STOPKEY operation for the traditional Top-N query has become the WINDOW NOSORT STOPKEY operation for the analytical function. However, the expected number of rows is not known to the optimizer—any number of rows could have the lowest group_key value. Still the index range scan is aborted once the required rows have been fetched. On the one hand, the consistent gets are even better as with the sub-query statement. On the other hand, the cost value is higher. Whenever you use analytic functions, go for a benchmark to know the actual performance. Let’s have some thoughts about this optimization. The database knows that the index order corresponds to the OVER (ORDER BY) clause and avoids the the sort operation. But even more impressive is that that it can abort the range scan when the first value that doesn’t match the rnk <= 1 expression is fetched. That is only possible because the dense_rank() function can not decrease if the rows are fetched in order of the OVER(ORDER BY) clause. That’s impressive, isn’t it? Declaring the partition is required to make sure those start_keys that don’t have a group_key of one will still show up, with their lowest group_key value. Although no sort is required, the STOPKEY has disappeared from the WINDOW NOSORT operation. That means that the full index range scan will be performed; for all 359 rows where start_key='St'. On top of that, the number of consistent gets is rather high. A closer look into the execution plan reveals that the entire row is fetched from the table before the filter on the analytic expression is applied. The junk column that is fetched from the table is not required for the evaluation of this predicate; it would be possible to fetch that column only for those rows that pass the filter. The expensive step in this execution plan is the table access. If the table access would be moved up to take place after the window filter, the cost for this step would be 3260 (one for each fetched row). The total cost for the plan would probably stay below 7000; that is, lower then the cost for the full table scan plan. Just to re-emphasize the motivation behind the view that can serve both needs; it is about multidimensional optimization—and that has nothing to do with OLAP! Typically, performance optimization takes only one dimension into account; that is, performance. So far so good, but what about long term maintenance? Very often, performance optimization reduces the maintainability of the software. That’s not a coincidence, it’s because maintainability is the only degree of freedom during optimization. Unfortunately, reduced maintainability is very hard to notice. If it is noticed at all, it is probably years later. I have been in both worlds for some years—operations and development—and try to optimize for all dimensions whenever possible because all of them are important for the business. My tests were conducted on 11R2. Markus Winand teaches efficient SQL—inhouse and online. 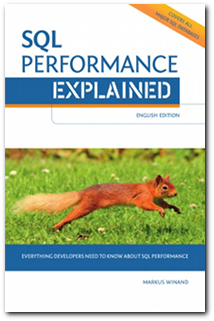 He minimizes the development time using modern SQL and optimizes the runtime with smart indexing—for that he also published the book SQL Performance Explained.